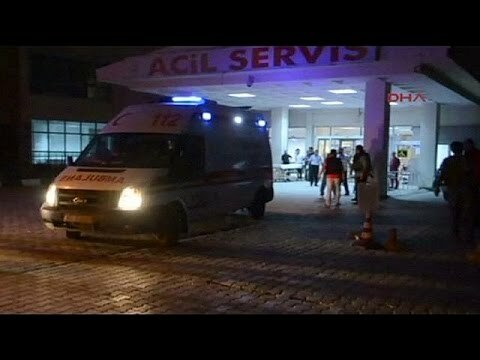 Stemming from a presumed Islamic State (IS) suicide bombing killing 32 leftist Kurdish university students in Suruc and the killing of several Turkish policeman claimed by the Kurdistan Workers’ Party (PKK), Turkey has begun bombarding both IS forces in Syria and PKK bases located in the Qandil Mountains in northern Iraq. But what has provoked this punishing campaign? It’s a sharp reversal of policy given the considerable political capital that Turkey’s ruling Justice and Development Party (AKP) has expended in: a) attempting to remain above the fray in Syria; and b) the peace process with the PKK, which angered many Turkish nationalists. War is merely the continuation of policy by other means. The most obvious answer is that this is a security issue. Both IS and the PKK have attacked Turkish citizens and members of the security services so it is unsurprising that the Turkish government has retaliated. Like all governments, its priority is to protect its citizens. However, a number of other considerations are at play. A more cynical interpretation would look to Turkey’s domestic politics. Since June’s elections, when the AKP failed to win an outright majority for the first time in 13 years, Turkish political parties have been unable to form a coalition government. This means the possibility of fresh elections in the near future is very real. By embarking on a course of armed conflict, the AKP may be positioning itself with an eye to elections by invoking a garrison nationalism. 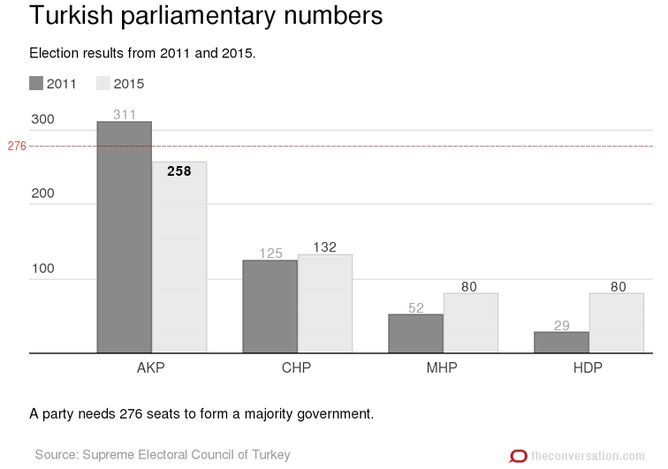 The AKP will claim that now, more than ever, Turkey needs a strong majority government. Armed conflict is a tried and tested method to persuade nationalists and conservatives alike to “circle the wagons” and support the incumbent power. At the last elections, the AKP also lost some of its traditional base, conservative Kurds, to the pro-Kurdish People’s Democratic Party (HDP). The HDP won 80 seats, a gain of 51, as the AKP was left 18 seats short of a majority. This was largely due to anger over the government’s inaction during the siege of the Syrian Kurdish town of Kobane. Many Kurds believe that the Turkish government is in cahoots with IS. Opposition figures have gone so far as to label government officials “accomplices” to the Suruc bombing. The specific targeting of Kurdish university students planning a reconstruction trip to Kobane is noteworthy for several reasons. First, this recalled both the siege of the town and the subsequent IS suicide mission there in June, which massacred more than 150. Second, IS has denounced the PKK and its affiliates in Syria as “atheists”. This highlights the diametrically opposed visions that contending movements have for the future of the region. Third, the bombing may have been intended to sow distrust and create a further rift between Turkish Kurds and the government. By responding strongly, the Turkish government is attempting to dispel the theory that it has been collaborating with IS, and thereby win back the conservative Kurd vote. The notionally progressive agenda of the newly elected HDP, for instance on LGBT rights, does not necessarily sit well with conservative Kurds. The AKP similarly lost votes to the far right because Turkish nationalists were angry about the peace process with the PKK inaugurated by President Recep Erdogan in 2013. As such, the Turkish government’s attacks on the PKK can be viewed as a similar ploy to win back the nationalist vote. Are you pro-Turkey or pro-PKK? As a result, the HDP could lose non-Kurdish votes in particular and fall back below the 10% threshold required for representation in parliament. Should this happen, the AKP will be the main beneficiary under Turkey’s system of proportional representation as it is still by far the highest-polling party. It is also worth noting that the PKK is not all that popular with many Kurds, especially conservatives. They see the PKK as rigid doctrinaire Marxists and atheists. Turkish actions against the PKK, in addition, afford the Kurdish Regional Government (KRG) in northern Iraq a variety of opportunities. The turmoil allows the KRG to capitalise on the situation in its ongoing turf war with the PKK. The KRG has accused the PKK of encroaching on its territory and there has been notable tension over the city of Sinjar. KRG president Masoud Barzani has also cleverly moved to position himself as peacemaker between Turkey and the PKK to enhance his prestige within both Turkey and the wider Kurdish national movement. Finally, Turkey has been welcomed back into the US and NATO fold following a year of tension arising from the Turkish government’s perceived inaction on IS. The US-Turkish deal allowing the US to use the Turkish airbase at Incirlik not only cements Washington’s support of Ankara’s security concerns, but also fulfils Turkey’s long-held desire to create a buffer, or “safe”, zone in Syria. Extending west of the Euphrates to Aleppo province, such a zone will, in turn, prevent the cantons of Syrian Kurdistan from uniting. That is a scenario that the Turkish government views as a potential existential threat to the Turkish state. Presumably establishing this safe zone will also help stem the flow of Syrian refugees to Turkey, which already accommodates more than 1.5 million. Blowback from both IS and the PKK is possible, but if and when this occurs such reprisals will be used to validate the Turkish government’s nationalist/security-orientated agenda. In purely political terms (as opposed to ethical considerations and potential death tolls), the Turkish government has deftly taken the tragedy at Suruc and translated it into both domestic and international political gains. Tristan Dunning is Honorary Research Fellow, School of Historical and Philosophical Inquiry at The University of Queensland.